Bentgate, online at Bentgate.com, offers gear for your next outdoor adventure. Bentgate is the destination for apparel, gear, and supplies for snowboarding, skiing, rock climbing, mountaineering, hiking, backpacking, camping, and more. No matter the weather, Bentgate offers apparel and footwear for men and women designed to deal with the iciest of winter weather and the heat of summer. Bentgate carries top brands like Mammut, Black Diamond Equipment, Arcteryx, DPS Skis, Icelantic, GoPro, Dynafit, Western Mountaineering, Hilleberg Tents, prAna, and more. But before you shop, get all the latest bentgate.com discounts, Bentgate promotions, and Bentgate coupon codes found here at RetailSteal.com. Bentgate offer free standard shipping for purchases over $49 within the Continental United States. Bentgate also ships to Hawaii, Alaska, APO/FPO addresses, and international destinations. Some restrictions may apply. See site for more information. Save up to 40% on a great selection of footwear on sale at Bentgate. Click to save. 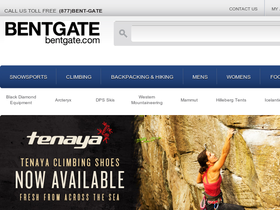 Save up to 40% on climbing gear from Bentgate. Shop now and save. Save up to 40% on backpacking and hiking gear on sale at Bentgate. Click to shop and save. Enjoy free shipping from Bentgate on purchases $49+. Offer applies for deliveries within the continental U.S. Click to shop and save. Save up to 40% on women's apparel on sale at Bentgate. Click here to shop and save on Arcteryx, Marmot, Icebreaker, and more. Shop for men's apparel at bentgate.com and save up to 40% or more. Shop now and save. Save up to 40% in the snowsports sale section at Bentgate. Click link to shop and save today on brands like Black Diamond, Dynafit, Salomon, and more. Save up to 25% or more on the skis in clearance at Bentgate. Click link to shop and save on Rossignol, Black Diamond, K2, Moment, and more. Shop at bentgate.com and save $64 off a Flylow Swindler jacket. Click here to shop.